First Lines: Long ago, in an ancient and distant realm called the Kingdom of Backyard, there lived a warrior named Rock. Rock was the strongest in all the land, but he was sad because no one could give him a worthy challenge. The Legend of Rock, Paper, and Scissors is an imaginative origin story. All three “warriors” love competition, but lack a worthy opponent. When they all converse in “the great cavern of the Two-Car Garage,” they finally meet their matches. Rather than feeling anger at being beaten, they each enjoy the challenge of their “epic three-way battle” again and again. The story is a mini-mock epic (a form of satire), meaning it takes a trivial subject and elevates it to the heroic stature similar to the real epics of Homer and Virgil. 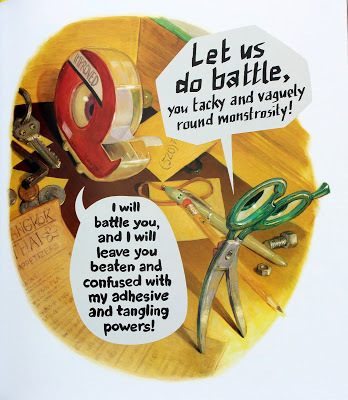 For instance, the backyard by the tree is “the mysterious Forest of Over by the Tire Swing,” and Scissors lives in “the Kitchen Realm in the tiny village of Junk Drawer.” Even the descriptions of these everyday objects are elevated. 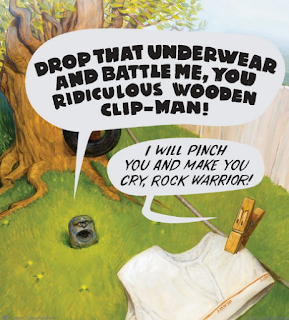 Paper is “a great warrior” who seeks “the glory of battle.” Later, Rock calls him “Great Knight of Paper.” Their whole quest is elevated so as to be worthy of a game played around the world “in backyards, on playgrounds, and yes, even in classrooms” in order to honor the great warriors. Competition and challenges are depicted in a positive way. They are shown as vital to the characters’ existence. Without a genuine challenge, they feel a sense of meaninglessness. In a world where everyone wins a trophy for existing, this message is refreshing. Finding people and situations that prompt us to work harder and to compete fairly are good for the soul. They make us better people. Of course, there is the flip side of bad sportsmanship and unhealthy competition. This book can be a conversation starter on these issues. The expressive fonts and bold colors add to the wacky energy and humorous exploits of the plot. Illustrator Adam Rex creates memorable action-packed battle scenes between the main characters and other inanimate objects like dinosaur-shaped chicken nuggets, a tangy apricot, and a desktop printer. This surreal adventure demands to be read out loud with flair and melodrama. 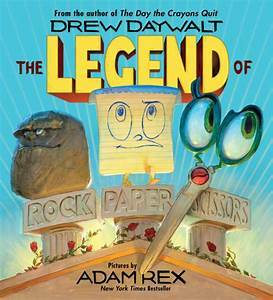 Author Drew Daywalt elevates a common children’s game by giving it an epic origin story rivaling the likes of Homer’s Odyssey and Virgil’s Aeneid. Well, not quite that epic. 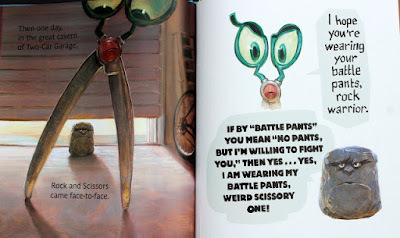 Putting all hyperbole aside, in picture book terms— The Legend of Rock, Paper, and Scissors is definitely the gold standard of humor, imagination, and entertainment. Literature: Use as a springboard to teach about origin stories in myths and folktales. Discuss what makes an entertaining origin story and their importance in literature/society. Character: Compare healthy vs. unhealthy competition. Writing: Students can pick a game, tradition, or object and write an origin story for it. Reading: Read the children’s version of a classic epic, like the Iliad, Odyssey, Gilgamesh, or Aeneid. 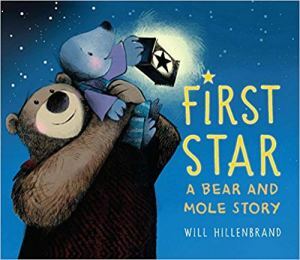 There are many excellence ones with pictures, which is helpful in building a foundational understanding of the stories before tackling them in middle or high school. Math: Practice predicting and graphing probability. Here is a possible lesson idea. It's also a fun share read, as there is a lot of dialogue and the pictures/text make it clear who is saying what.